Photos of my melted PUL. This only happened to one out of 6, so far. So, this one has a new purpose now! Haute Pocket One Size Pocket diapers are one of my all time favorite diaper! I have 6 of the old “breathable” version and 3 of the new “traditional” version. I’ve been using these diapers for quite some time and most of them have held up well. (I did have one diaper “melt” in the dryer. 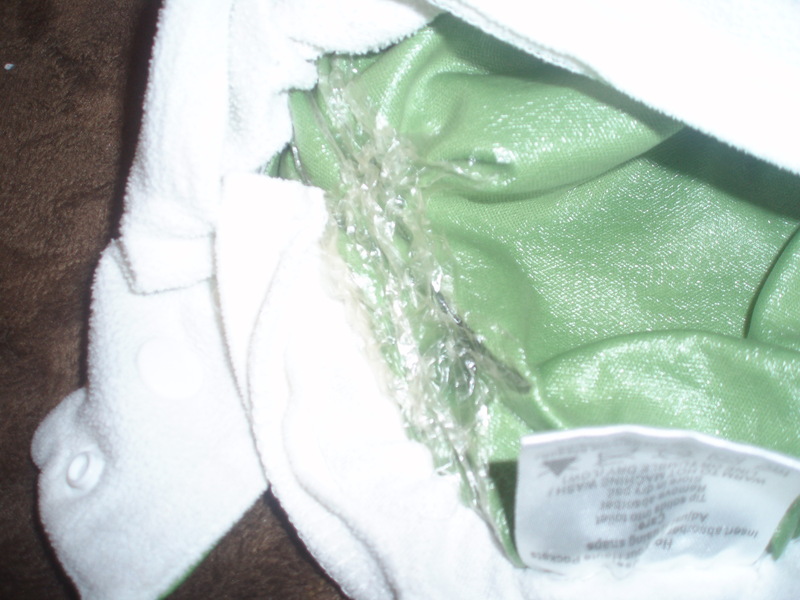 The plastic backing of the PUL melted and pulled away from the diaper, making that particular diaper completely unusable. However, this has so far only happened to the one diaper, though they are all washed the same and all washed together. Go figure. I did get a year’s use out of it, so I didn’t mourn its passing too much!) Since the original writing of this post, I have had 3 with shot elastic after less than 10 months of use. The three with bad elastic were Traditional One Size Haute Pockets. The details. Haute Pocket claims their diaper will fit most babies from birth to potty training, specifying a fit from 8 lbs. to 35 lbs. My newborns are not 8 lbs, so that bit is out for me! However, they really do fit an 8 lb. infant! If your baby is on the rounder side, they would probably fit a 7 lb. baby! And they really do fit all the way up to 35 lbs. I have a 35 lb. 3 year old that can still fit in these diapers. They may fit a child weighing more than 35 lbs., if they child is on the tall and skinny end of things. My 3 year old has thunder thighs, and these fit her. The interior fabric is a microfleece. It is very soft. It does pill a bit over time, but continues to remain nice and soft. The inserts are oddly shaped, but work really well! The doublers snap onto the insert, so they don’t slide around inside the diaper. I’m not sure if you can tell in the picture above, but the blue diaper on the right is the old version and the yellow diaper on the left is the new version. The old version is slightly smaller than the new version (and is a very tight fit on my 35 lb. child). The old version is “breathable.” I like them, but they are not good overnight or traveling diapers. They don’t leak, but if left on for a long time (like over night) the water vapor will “breath” out of the diaper and cause pjs to feel damp when they wake up. The very good thing about the “breathable” version is that they let their little bums breath a bit. I like this feature a lot for daytime diapers. If your child has a slightly red bottom, put them in a breathable diaper and the redness clears up! I actually try to make it a point to put this diaper on first thing after they wake up. Seems nice to have a little air flow after a full night in one diaper. The inserts on the newer version are also a little wider. They will still work with the old version and the old version inserts still work in the new version. The 15ish lb. Emery modeling a new version Haute Pocket for you. This picture shows you my one and only complaint against Haute Pockets. The pocket opening gapes. It doesn’t effect wear or use, but it looks bad in my diaper basket. Like most pocket diapers, you have to make sure the interior is tucked into the diaper in the back. The opening is wider than most pocket diapers, which makes stuffing very simple (especially with the larger insert) but it creates this problem. I really like Haute Pockets. I have never used the hook & loop version, just snaps. These are fabulous little diapers. Who would I recommend these diapers to? Anyone, really! If you like the fit of bumGenius one size diapers, you would like these diapers. Or if you are looking for an alternative to bumGenius one size diapers, these diapers are for you! If you need a nice pocket diaper, you’ll like these diapers. I have revised my recommendation based on long term use. I do not recommend these diapers. They do not hold up and last as long as they should. With all three of my Traditional Style Haute Pockets, the elastic was shot and needing replacement within 10 months. With the old breathable style, I had one with melting PUL. So, out of 9 Haute Pockets over the course of a year, I now only have 5 of them that are usable. (Note: Elastic in cloth diapers can be replaced. When it is shot you do not necessarily loose diaper function. If you don’t sew, you’ll have to find someone to replace the elastic. I do sew but have not gotten around to replacing the elastic. 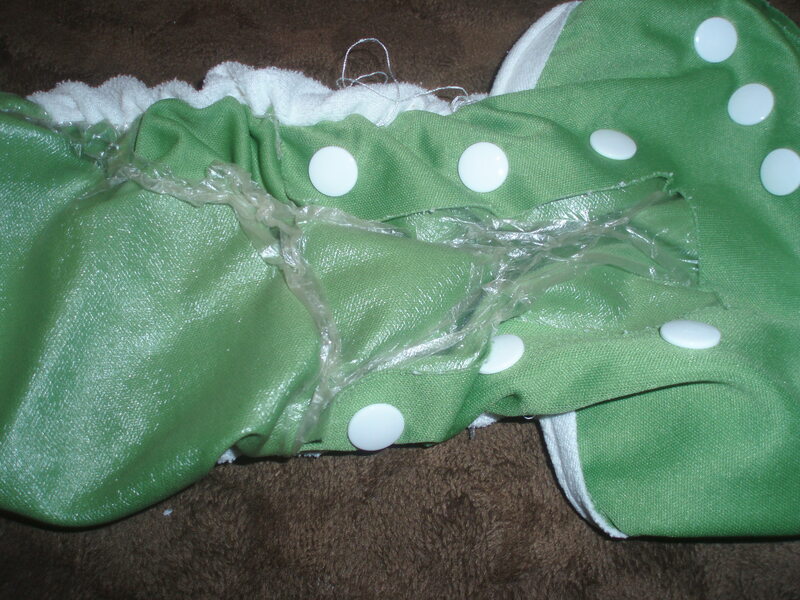 When I do replace my elastic, I’ll try to provide a tutorial on elastic replacement for those of you that sew. However, I do not think the elastic in a diaper should require replacement during one child’s worth of use. That means, I think the elastic should last for at least 2 years. Replacing elastic after 2 years is not a huge deal, in my opinion. Replacing it before a year is up is completely unacceptable.) If you need a snap diaper with fleece interior, consider Fuzzi Buns or Tweedle Bugs. If you like the look of a Haute Pocket and don’t mind a bulky diaper, try SmartiPants. You may also like WAHMies. What diapers do you recommend for newborns? 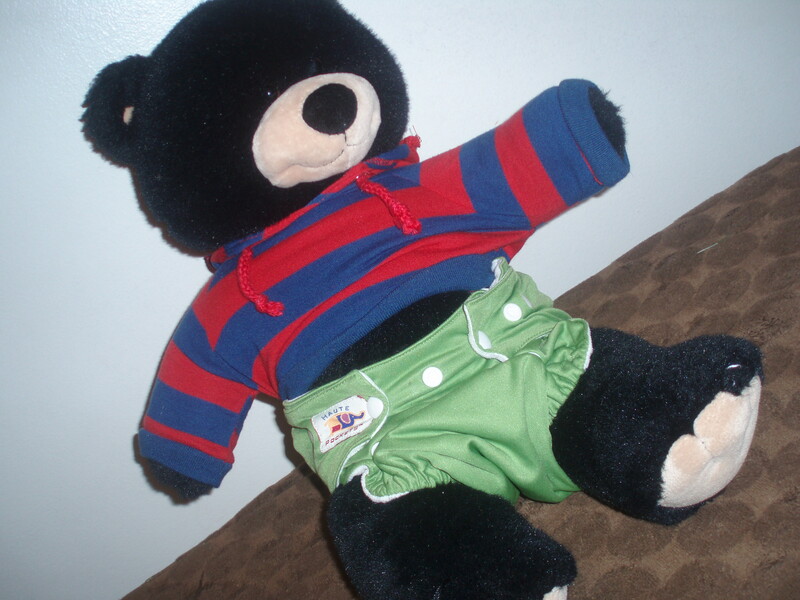 I started cloth diapering when my 2nd was about 1 and a 1/2. Now we are getting ready for baby #3. I know the os bumGenius that we have would not have fit either of my daughters when they were newborns. Newborn prefolds and covers. I borrowed some prefolds from a friend and bought 3 covers because nothing else works better and is cheaper for a newborn. Our son is about 8lbs now and is starting to fit into our bumgenius and haute pockets. But for such a short time I don’t think it’s worth spending a lot of money on expensive newborn diapers. Prefolds are so cheap. I had the same melting problem, but after just 2 months! I just tried to send an email to haute but it bounced back. Can you tell me what email address worked for you? I just contacted them via the e-mail offered on their website, which is info@hautebabyproducts.com. I tried, recently, to go to their website and couldn’t, so maybe they are down or shut down- who knows! Maybe you could contact whoever sold you the Haute Pocket and see if they can get you in touch with them or maybe they’ll replace the diapers from their stock! I heard that they went out of business from the website I bought them from, and we both know why! I’ve already received replacements for a couple of them, but now even the replacements have gone bad. And I don’t think she wants to replace them again. At least I have the comfort of knowing it’s not just me having this problem–for a minute I thought maybe I was washing with water that was too hot. Oh well. BumGenius have been great so far, so at least I can count on some of them.